To provide the most efficient fire and EMS service for our community, we will act and perform in a safe, courteous and professional manner. As a member of the fire service, we have chosen to protect the lives and property of the citizens and visitors of our community and surrounding communities as needed. Our members have chosen to be part of a team that takes pride in representing the Annawan Alba Fire Protection District. We will strive to create a strong bond with the community by involving them in fire education, prevention and protection. 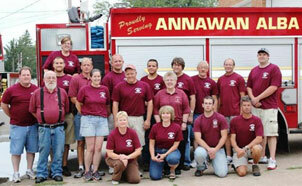 The Annawan/Alba Fire Protection District is a volunteer fire department. Over 25 volunteers provide fire suppression, EMS service and rescue to Annawan and the 72 square mile area. The district has two ambulances, two engines, one tanker, and one rescue truck. The Fire Station located at 101 West Front Street was built in 1945. The Annawan/Alba Fire District offers assistance to neighboring communities when called upon and is an excellent community partner with Annawan’s annual events. When the emergency siren is activated, please allow the responding volunteers the right of way. Responding volunteers are identified by a flashing blue light located on their dashboard as well as four-way blinkers on their personal vehicle. The Annawan-Alba Fire Protection District Commission meets the fourth Monday of each month at 7:45 p.m. at the fire station. The members of the fire department meet every Monday evening for training.